In the years 1946 to 1964, following World War II, there was a global explosion of births, creating a generation that came to be known as the Baby Boomers. 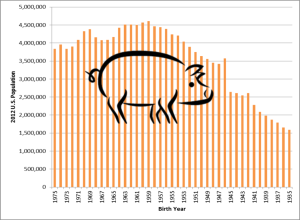 In the United States, this outsized group of consumers became known as the “pig in the python” – comparing the generation to a pig swallowed by a python, gradually moving through the system (the python) and changing society and consumer spending at every life stage. 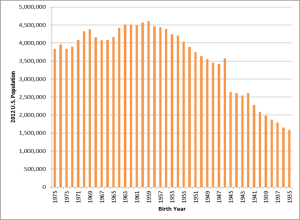 After the Baby Boom, birth rates cooled off, creating Generation X. 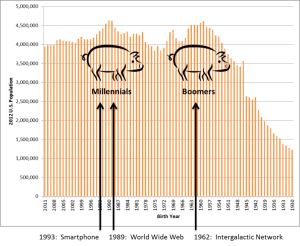 Then, as the Baby Boomers starting having babies, birth rates accelerated again, creating what was initially known as the Echo Baby Boom and, as we approached the year 2000, became known as the Millennials. We now have TWO big fat pigs in the python, with both pigs changing society and consumer spending as they move through life. The global disruption created by the inventions of the web and smartphone is often compared to the scale of disruption caused by the Gutenberg Press. Many historians believe that the 15th century invention of the Gutenberg Press was the most important technological transformation point in human history. The mechanical moveable type allowed production of multiple copies of books in a mere fraction of the time that it took to hand copy manuscripts. 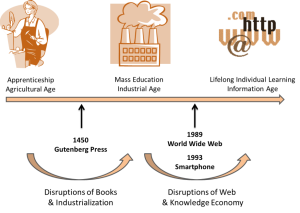 The state of literacy and learning in the world was forever altered, catalyzing the shift from the Agricultural Age to the Industrial Age and from one-on-one apprenticeship learning to mass education models. The impact of the current disruptive technologies of computing, the internet and mobile access are being compared to that transformation. We are moving from a model of mass education to education that will be highly customized for individuals. We are moving from “once and done” learning in institutions to a requirement for individual lifelong learning in order to stay relevant in our fast-changing world. EVERY THING and EVERY EXPERIENCE is changing as our society adapts to having massive amounts of data and information literally at our fingertips. We are on the verge of a new era. No one label is consistently applied to this new technology and innovation-driven era. Our current favorite label is the Age of Context, a label (and book) by Robert Scoble and Shel Israel, the authors and analysts who correctly predicted the commercial importance of social media in 2006. This Age of Context is a superforce driven by the convergence of five forces: mobile, data, sensors and location-based technology — combined with social media. So, this is a lot of context (perhaps appropriate in the Age of Context), but this context is critical to understanding the Millennial generation and their relationship to other generations, especially the Baby Boomers. The Millennials, born in the years from 1980 to 1995, arrived during this period of technological disruption and grew up as “digital natives”, with an intuitive understanding of the possibilities. The Baby Boomers have discovered that they have a lot to learn. 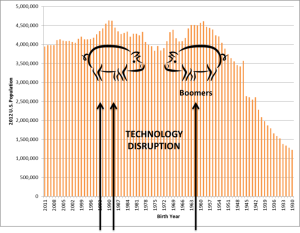 The Boomers are described as “digital immigrants”, constantly challenged, and sometimes frustrated, with integrating these technologies into their professional and personal lives. This disruption has created a technology divide and redefined how older and younger generations interact. For the first time in history, the younger generation has a stronger set of specific skills and knowledge than the older generation. It is no longer just an “old-and-experienced teaches the young” learning model. Our learning now flows in both generational directions with “young teaching old” as well as “old teaching young”. At AIMsights, we are studying these generations — how they learn, make decisions and influence each other. AIMsights analysis, combined with insights from our marketing expertise and experience, helps business reach its target markets…building brand awareness and competitive advantage. 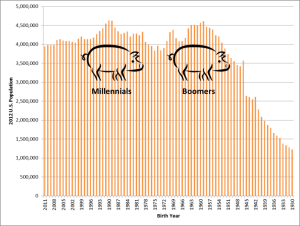 Get smart about Millennials and Baby Boomers… the two generations that are driving sales!